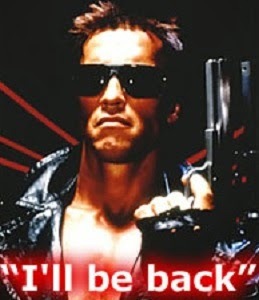 to terminate your investment growth !" mutual fund fees giving you a headache." Are you interested in having a robo-advisor manage your investments? If so, you can escape high management fees in a low-cost ETF portfolio, created by the "robo-advisors" at ShareOwner. What ShareOwner offers are model portfolios that even the laziest investors can appreciate. Couch Potato investors have to pick their ETFs and balance/trade them every now and again. If that is too much effort for you, ShareOwner has created 5 different model portfolios to meet the range of risk/return profiles of different investors. These include Aggressive Growth, Growth, Balanced, Conservative and Income portfolios with between 100% and 25% equity exposure. The best thing? ShareOwner does all the rebalancing for you and the fees are low, low, low - especially for a large account. 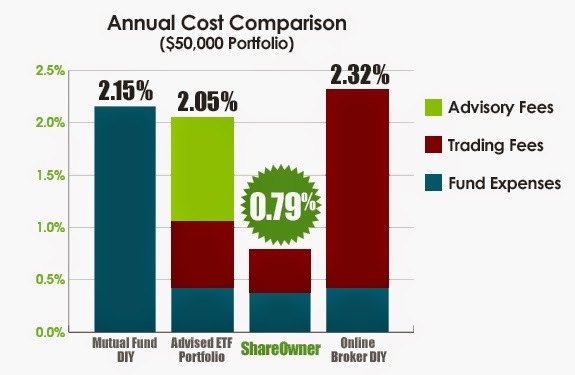 ShareOwner fees are 0.5% on top of the ETF expenses (MER) as shown in the chart to the left. But fees are capped at $40/month if you have $100,000 or more invested. So if you invest $200,000, your fees drop in half percentage-wise. For example, the Balanced Portfolio funds have a weighted MER of 0.27% (iShares, BMO, and Vanguard funds) - add $480/$200,000 for another 0.24% and you a paying 0.51% to be absolutely hands off in your index investing. Let's face it - time is money. Commission-free automatic DRIP is another time and cost saving feature.